This game is awesome. 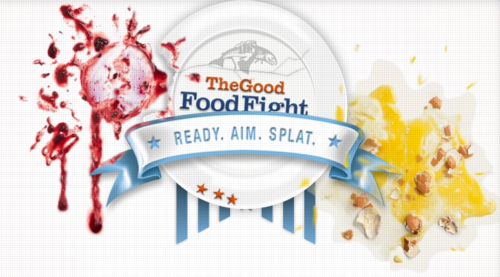 Banking on the knowledge that most of us have enjoyed the fantasy of a good food fight but have had little opportunity to act on it, mono has created The Good Food Fight for General Mills' Eat Better America. Gamers get to choose between three healthy dishes, based on splat factor, hurlability and stainage. Then they get to select a trash-talking, food-slewing chef. We were disappointed at first because after choosing a chef, the site loaded a recipe page. So we thought we'd write the game off - then all of a sudden this crazy chef in a kimono comes leaping out of the frame throwing food at us and saying all kinds of wild things. It was amazing. It was like playing a game of Street Fighter and finding our little characters come to life to harass us. It was like Animator vs. Animation, except with a tiny person and not a sociopathic stick figure. Anyway, we lost the game, and in a manner most demeaning we were told to go clean ourselves up. Bummer. But in a good way. So there's this YouTube video contest called The Savvies Make the Logo Bigger points to that asks people to submit videos illustrating how they plan to become Dollar Menunaires just like the stuck-in-the-seventies dude in the contest video does by showing how to save money by turning an old pair of jeans into a pair of shorts...too short shorts, that is. One of the best responses we saw in the five minutes we gave ourselves to witness this not so bad piece of CGMish marketing came from YouTuber JamesatWar who shared with us how to save money by using less toilet paper. Hey, here's an idea we've never seen before. To promote Colgate's Max Fresh, Y&R Interactive and Tele-Pele have created a banner that behaves with direct feedback from users. Encouraged to test their "freshness levels" via telephone, the curious click on the banner to get a phone number. After dialing in a code and blowing into the speaker, the site will actually react by freezing before your eyes. This isn't just something we'd get out of our seats to try; it's something we'd tell friends about. Good stuff! The campaign launched across all main Israeli online destinations, including walla!, msn, tapuz, and smile media, on August 12th. Here's a new commercial from GM Desedo Film's Raafi Rivero promoting the company's Hummer H3H Hydrogen vehicle which is supposedly set to arrive in Spring 2008. In the commercial the Hummer traverses across National Geographic and National Geographic-like vistas. The Hummer is being branded the National Geographic Edition. Teenage boys (from the seventies and eighties, of course, as one commenter bashes us for daring to make a joke that's relevant to anyone over the age of 30) world over are now wondering if the truck comes equipped with leather seats emblazoned with images of naked African and Aborigine tribeswomen for their viewing pleasure. For reasons that defy logic, this microsite put us in a really buoyant mood. Everything from the greeting, "Let me - teach you!" to the retro theme song, to the sad little martial arts graphic at the right of the video, to the campy slogan, "Grab your nuts - it's go time!" coaxed a smile from our scowly little faces. The site is the work of Jansen Weatherly, the "world renowned activities expert and martial arts specialist" who's been traveling the country and filming his adventures. Imagine Napoleon Dynamite, all grown up and with a passion for adventure ... and PayDay candy bars. More to the point, it looks like a promotion for Dutchstar RVs, which appear to be Jansen's gear of choice.